A Viewpoint Not Far From New Futuropolis shows the exploration of José Galant into the world of Steampunk Science Fiction. He employs several surreal elements which add o the dreamlike quality of this piece including the hazy atmosphere, the purple sky, and the strange green rock. Steampunk Airships float through the air, and an enormous moon hangs over the cityscape in this fine art print. José Galant’s multifaceted work ranges from modern surrealism artworks of Steampunk Science Fiction and Art Nouveau Fantasy genre to 3D Geometric Abstractions. José Galant alternates between traditional techniques in acrylic or watercolor painting to 3D Computer Graphics or Augmented Reality. The project on which he is working right now, called “Imaginary Destinations”, is a personal metaphor of the 3D virtual worlds. In the initial phase of the project, he is painting a wide range of artworks. In its next phase, he will select one of the paintings and will transform it into a virtual world in which users can interact with each other through online 3D avatars. In the last phase of the project, he wants to convert the exhibition spaces into imaginary destinations and the public into avatars, combining the paintings with Augmented Reality and Virtual Reality. José Galant received formal training at the Fine Arts and Graphic Design School “Groc” in Barcelona (Spain) and the “École supérieure des Beaux Arts” in Perpignan (France). He has also obtained a post-graduate degree in 3D Computer Graphics at Escola d’Informática i Oficis de Barcelona and a second post-graduate degree at the Autodesk Training Center of Barcelona. Over the last few years, his works have been collected by private clients and public organizations in various countries throughout the world including USA, Mexico, Spain, Austria, Italy and Greece. He has been participating in Art Fairs in the United States and Europe like ArtExpo New York, Art Shopping París Spring and Autumn Edition, 1st International Modern Art Fair at Schloss Neuberg, Central Europe Fine Art Biennale of Blindenmarkt, 1st International Mail Art Mirano in Venice and the Contemporary Art Salon of Montreux, to name just a few. He is currently represented by Mahlstedt Gallery and he has started other collaborations with galleries in Austria, Netherlands, Australia and Spain. Boatride in the Old Times Square by José Galant is a classic example of Neo-Surrealist painting. 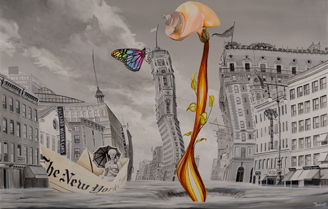 José Galant explores the ethereal nature of dreams and the subconscious in this painting through various surreal elements such as the rainbow butterfly and the seashell. A prim woman floats down the flooded streets in a newspaper boat, and the surrounding architecture wavers like an unclear memory. This fine art print is offered by a New York art gallery, complementing the setting in old Times Square. From the Brothel of Avignon's Street to the Bateau Lavior by José Galant is a classic example of Neo-Surrealist painting. José Galant explores the ethereal nature of dreams and the subconscious in this painting through various surreal elements. 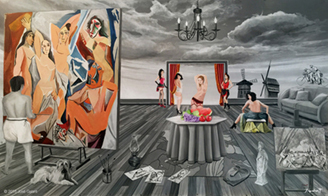 In this fine art painting, he references the famous Les Demoiselles d'Avignon painting, showing the artist at work within his fantasy workplace, the women posed for his painting pleasure. Old Aerostatic Park by José Galant is a classic example of Neo-Surrealist artwork. José Galant explores the ethereal nature of dreams and the subconscious in this fine art piece through various surreal elements. 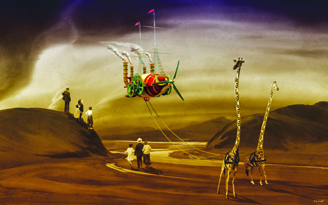 In this steampunk universe, the artist has created a world in which giraffes are used as pack animals, towing along a steampunk airship as two families look on. This fine art print breaks with reality not only in its content, but in the strange yellow and purple color scheme.